1. The moment you open Boonzi for the first time, you are invited to create your profile. A profile is no more than the file where all your data are recorded – transactions, reports, etc. If you wish, you may choose another name for your profile, and the folder where you want to record it. By default, your profile will be saved as MyMoney.bon and will be saved in the Documents folder. After assigning a name to your profile file, click “Next“. 2. You can choose to protect your profile with a password. If you choose to do so BE CAREFUL: it is VERY important not to lose or forget your password, otherwise you will not be able to recover it. If you still want to protect your profile with a password, set it and click Next. Attention: You can not unlock / protect your profile with a password later. If you decide to protect your profile make sure that you save the password in a safe place, otherwise you may not recover it. Learn more here. 3. Next, you can choose the list of entities and categories. Boonzi comes with three lists: Portugal, USA and UK, which include the most common entities and categories in those two languages – Portuguese and English. In this step of the Wizard, Boonzi will ask you which list you’d like to use, although you may also choose to leave your profile empty if you wish. You can add your entities and categories later, or even remove and edit existing ones. Your license key is sent to you by email. 2. To create your first account, click the button on the upper right corner. 4. In order to get a correct balance after importing your transactions, it is important to write down your exact balance at 11:59 p.m. of the date you specify (for example, your balance yesterday at 11:59 p.m.). Every time you insert transactions, Boonzi will automatically calculate your balance before and after the dates you specify. 5. Take the opportunity to create your other accounts by clicking the button on the upper right corner of the screen. You can create accounts in cash, term loans, etc.. To create a credit account, simply indicate a negative balance. Now that you have created your account, it’s time to start adding transactions. Although Boonzi allows you to import bank statements (as explained below), you can also enter them manually rather quickly. Let’s start by entering your first transaction. In the upper right corner, click the “New Transaction” button. Or “Ctrl + N”. Start by specifying the type of transaction: Expense, Income, or Transfer. After this, create a Payee. For example: “Amazon”, “Starbucks”, “Wallmart”, etc. Next time, Boonzi will automatically enter the Payee for the transaction so you don’t have to write it again. Set a date for the transaction. There is no need to write the full date: if you press “2” Boonzi will fill out the date field with day 2 of the present month. You can also write “today” or “5 out”, or other combinations. You must now enter a category and subcategory (if necessary) for the transaction. For example: “Food : Dining out”. By using “:” (colon) Boonzi creates the category “Food” and the sub-category “Restoration”. Boonzi will also assign the category to the payee you specified. Next time you enter a transaction with the same payee, the category will be filled automatically. Specify the amount of the transaction and save it by clicking the “Save” button or Ctrl+S. Add written notes to your transaction. These notes are searchable which is very useful for filtering. Use your computer’s webcam to capture an invoice. The manual and individual insertion of all transactions is a boring and time consuming task. Fortunately, with Boonzi you won’t lose more than 2 minutes entering all your weekly transactions thanks to the feature that allows importing them directly from your online banking. This feature is completely safe since you never have to enter your bank data. See you importing works on Boonzi in this video. After this, follow the steps below. After this, it’s time to choose the account: select the account to which you want to import your bank extract. Now open your web-browser and log in to your online banking as usual. Locate your bank extract and select the transactions grid with your mouse. Make sure you only select this grid and nothing else. Click the selection using the right button on your mouse and the “Copy”. Return to Boonzi. Now you only have to select the “Import” button and Boonzi will try to recognize your statement and identify the columns. Confirm the columns that Boonzi has identified one by one. You only need to do this step the first time you import. Make sure Boonzi has correctly detected the “Date”, “Description” and “Amount” (or Debit and Credit) columns. Some banks use a column for Amount, while others use two columns: one for Debit and another for Credit. In this case, make sure that the two columns are identified correctly. Since its first import, Boonzi will fill the entity and category of each transaction it recognizes from the ones on this list you selected when you first created your profile. Fill the entities and categories that are left blank so that, the next time you import, Boonzi will recognize them as well and fill them automatically, saving you lots of time! Check out how to create categories in point 4.6. If Boonzi identifies similar transactions on your extract it will ask you if you want it to fill them automatically. If one or more transactions are transfers, click the little arrow on the left side of the transaction and choose the option “Mark as transfer”. If Boonzi identifies similar transactions in this extract it will ask you if you would like it to fill them out automatically. Now specify the Category. As explained before, you can write “Food : Dining out” to create the category “Food” and the sub-category “Dining out”. Press “Tab” to jump to the next transaction. If any of the transactions correspond to a transfer click on the arrow located on the left side of the transaction and select the “Mark as transfer” option. Repeat the process until the first import is concluded. The click “Save”. Boonzi will show you a summary of the import. Confirm the balance shown. If it does not match the one on your bank account you may have set your balance wrongly when you first created your account on Boonzi. Don’t worry: you can finish importing and then go to “Configuration > Accounts” to insert the correct balance on your account. fter this, Boonzi will adhust the balance of previous imports. After inserting or importing your transactions, you may need to research, filter or change the way they are displayed. For example, you may want to find all transactions in the category “Appliances”, see only the expenses, or change the display to view transactions grouped by category. These filters can be accessed at the top in the blue area, and appear in almost all screens – in particular in the Reports screen. Using the filter “by period” you can choose a date range such as “last week”, “this month”, “this year”, “from the beginning” or even “Between dates” to inidicate selected dates. 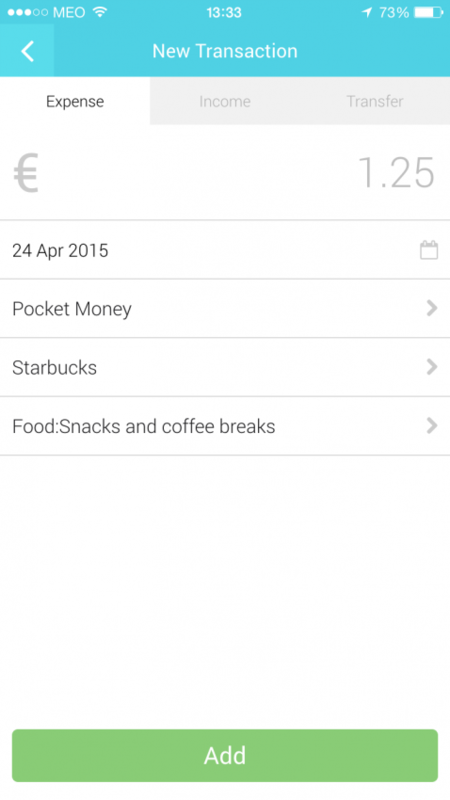 The filter “Show” allows you to choose to view only your “expenses”, “income” or “transfers”. The filter “Group by” is the one that allows grouping transactions by “transaction date”, “entity”, “category” and “insert date”. You can also use the Account box under the menu on the left to activate or deactivate a certain account. By doing this you will be indicating that you want to show/hide transactions from this account. All the information is then recalculated according to the accounts selected- including the total balance. A search-sensitive box, in which you can search for all transaction fields – including what you write in the Notes box. Take the opportunity to test the research. Multiple transaction editing. If you want to delete multiple transactions at the same time or change their category or entity using this option. The time has come to analyze expense and income reports by category and entity. On the menu, on the left, go to “Reports > Categories” or “Reports > Entities”. You can configure the period applied to the reports on the “Period” filter. You can also alter the type of report. Boonzi offers 3 kinds of previews: Bar, Pie and Table. You can also use the “Aggregate”, “Show” and “Order by” filters as well as the Accounts box on the left. In any of the views you can click the Category/Entity to see all the transactions belonging to them and that are being used in the report. Everytime you insert transactions on Boonzi, your balance, financial position, expense statistics and other reports are automatically recalculated and shown in a summarized and objective way in the Overview screen. 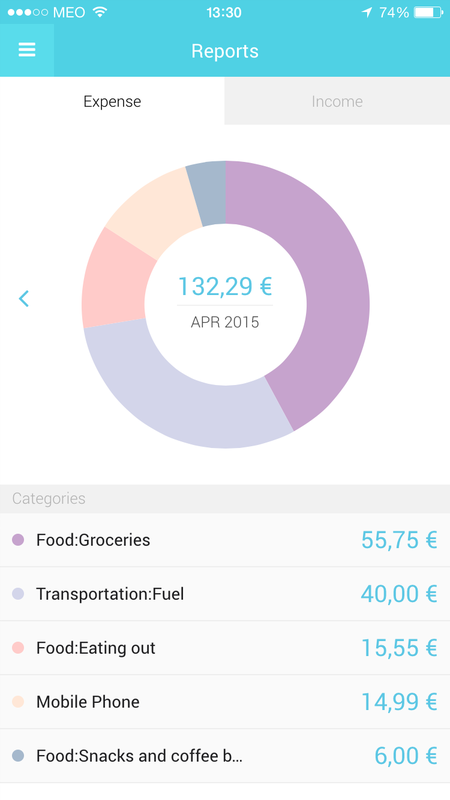 The Monthly Balance shows you the current month’s income and expenses as well as the final balance. The arrows on the left let you know if this month’s results are better or worse than the previous month’s. By placing the mouse on the arrow you can see comparison with the previous month. The Financial Position shows the balance of all your active bank accounts. You can activate or deactivate accounts on the Account box on the left. 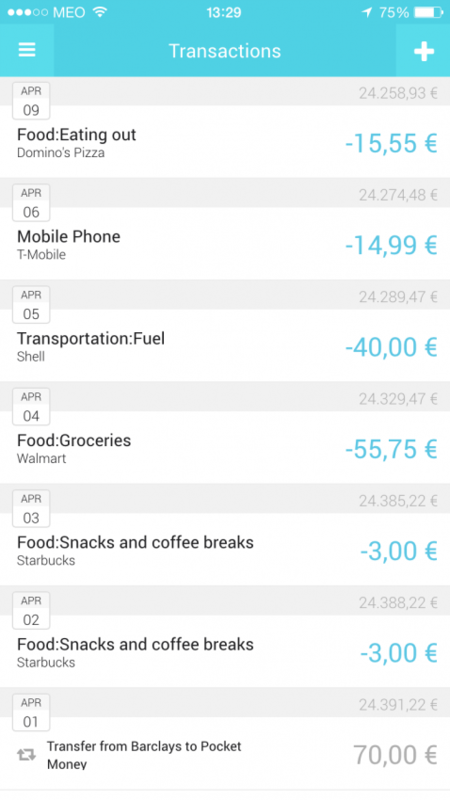 Top Expenses shows the main expenses of the current month. Se you have created a monthly budget or a reminder (as explained before), these will also appear on the Overview screen. In the filter area on the top, you can chage the period from “monthly” to “annual” and see the state of play of the year. In the “Reports – Cashflow” menu you can see your expenses, income, transfers and balance in extreme detail throughout the months. Specify the time period you wish to consult. For exampe “Since the beginning”. Boonzi will calculate and display all monthly expenses and income of each category on a very detailed table. 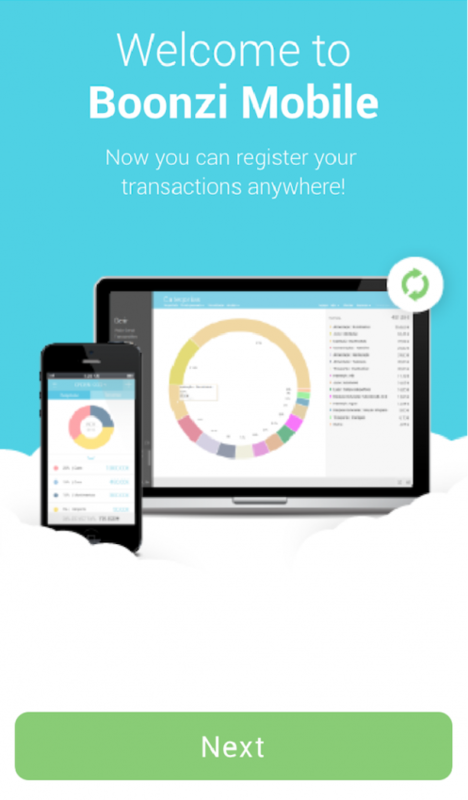 If you already have more than two months of transactions, Boonzi will also show the Total and monthly average. View the report in detail. If any amount arouses curiosity just click on it to open a window that shows the transactions of that category/month. At any time you can activate or deactivate an account on the Accounts box on the left to influence this report’s results, as well as all others. You can analyze the evolution of your bank balance over time in a line graph in the “Reports > Balance over time” section. Boonzi offers an agenda that allows you to create reminders or even schedule transactions. The feature is particularly useful to prevent forgetting certain priodic expenses such as condominium, IUC (? ), Insurance, etc. Go to “Agenda” (on the menu located on the left) and in the top right corner select “New reminder” or press “Ctrl + N”. A reminder can be recurrent. This means that you can specify if you want the reminder to repeat daily, monthly, annually, etc., besides you can still set an end date or a maximum number of repetitions. 3. When you create the reminder, you can choose to allow the automatic creation of the transaction. Thus, as the date you specify arrives, the reminder is automatically converted to a transaction so you do not have to enter it manually. 4. At any time, you can manually convert a reminder to the transaction. If you want to create a transaction for a reminder that is already set, just click on the arrow on the left side of the reminder, and select “Create transaction now.” You can also choose “Create now and edit” or “Skip occurrence”. 5. Your reminders will also appear in the Overview screen on the Agenda panel. This way not only will you always be on top of your financial situation, but will will also be prepared for the following payments by quickly checking the Overview screen. Imagine that by analyzing your reports you find out that your monthly expenses exceed revenues and you need to set limits on certain categories. To do this you should create a budget, which will allow you to set the maximum amounts for each expense category. Creating your monthly budget on Boonzi is very simple and fast, as you can see on the video below. 1. Start by navigating to the Budgets section. 3. In front of each category on which you want to set a limit, specify the maximum amount you are willing to spend that month and click “Save”. 4. A new horizontal bar displaying your current status on a specific category will appear. The bar turns red if you have exceeded the limit, orange if you are at risk of reaching the limit or green if it is far from the limit you have set for that category. If you have been using Boonzi for a while the app will auto-fill each category with its typical amount of income and expenses, saving you a lot of work. You can correct the auto-fill using help menu on the right (on the “Auto-Fill” option). For example, if you click “Expenses and Income of Set’14” Boonzi will auto-fill all categories with the values that you’ve spent / received in the month you have chosen. Then you only have to adjust the difference. 5. Just like with the Agenda’s Reminders, your budget will also be visible in the Overview screen. Synchronization is one of the services included in the Boonzi Premium license that allows you to insert or modify transactions in a computer and after a second, receive them in another computer or device. 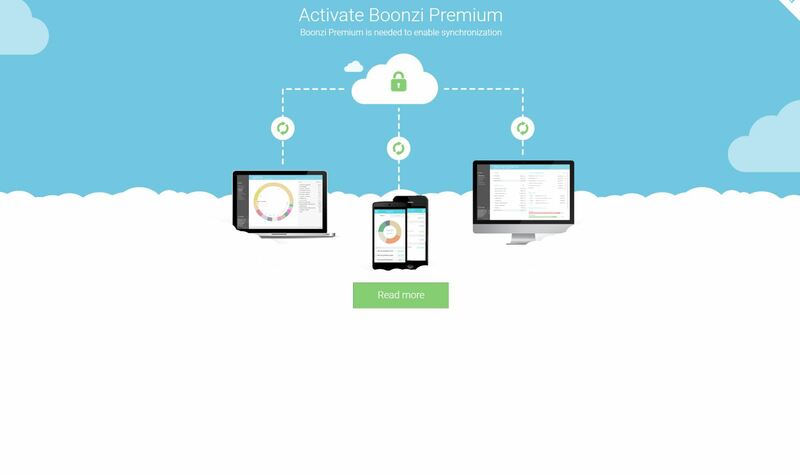 Boonzi Cloud is Boonzi’s native synchronization which enables you to gain access to your profile anywhere and also manage your family budget as a team. 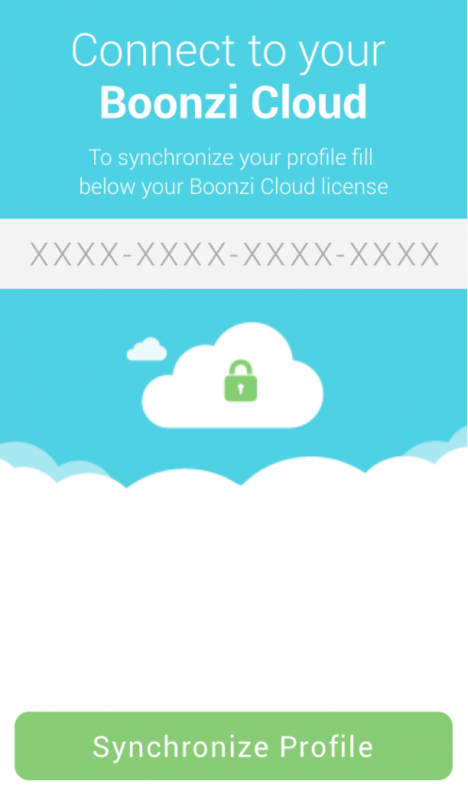 To be able to use the Boonzi Cloud, you will need Boonzi v.1.10 or newer. If you opted to not synchronize your profile with Boonzi Cloud when you created your profile (see #2.4) go to Configuration > Synchronize. Click “Read more”. Activate this option by clicking “Activate Boonzi Premium”. In order to be able to synchronize your existing profile with the Cloud choose the first option: “I want to load this profile to the Cloud” and click “Finish and Synchronize”. That’s it! From now on you can access your data from ay other computer or device. To access this profile’s data on other computers you will need to do the reverse proceding by set them to receive the data you already sent to the Cloud. Chose the second option “ Load the profile from the Cloud”. And it’s done! (Note: Later on, we will improve this process so that it won’t be necessary to create a new profile before you download from the Cloud. From the moment your profile is connected to the Cloud, whenever there is an alteration in any computer a button in the lower right corner will appear to announce that there is new data to synch. With only one click your alterations will be synchronized with the Cloud in only one second. Boonzi Mobile is a mobile app for Android and iPhone included in the Boonzi Premium license, which allows the user to register expenses on the go on the precise local and time at which they occur. 1. Click the “+” symbol in the top right corner of the phone screen. Choose the entity and the category. You can create new or look on the existing list. 4. Choose the entity and the category. You can create new ones or look for existing ones on the category and entity list. 5. Then click the green button “add”. On Boonzi Mobile you can select or deselect your accounts as you do in Boonzi Desktop. To do this click on the upper left corner of your screen. You can view the report expenses by category on Boonzi Mobile by clicking the icon in the upper left corner and select the “Reports” option. This is a initiation guide so we didn’t meantion all of Boonzi’s features, like inserting transactions in other currencies, change the language, date format, synch your profile between computers, manage credits, among others. Read the other guides on our website http://www.boonzi.com/learn to see all Boonzi’s features. And don’t be afraid to explore: Boonzi intuitive and was designed to help you save time. And money.